Erin Curet is a prolific paper roller with a colorful style all her own. 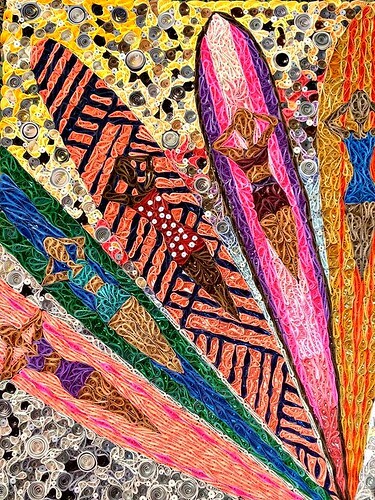 She relies on the use of vivid paper strips to paint mosaic pictures that are composed of tightly placed coils. 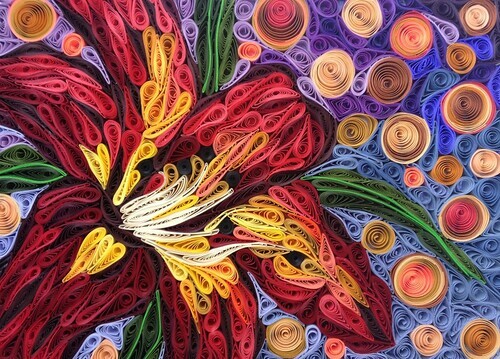 Erin discovered quilling only six years ago, but it has already taken her on quite a journey, both literally and figuratively. After developing her process and then making many mosaics, Erin - who I think it's safe to say is a bit of a free spirit - departed with her husband and young children from their midwestern home to travel the U.S. for a year while selling art. They found their way to Hawaii and wound up staying much longer than planned. Erin told the story of what brought them back to Michigan and the advent of Little Circles as a quilling product supplier via her Facebook business page. It was what prompted me to write to her to learn more. Hawaii was beautiful and so much fun, but eventually we got a little itchy being on an island. I had aspirations to start my quilling product line and the laws and shipping costs in Hawaii were not conducive to that. Here I have a beautiful art studio and a lot of space to store all of my paper and products. We love Northern Michigan - it is every bit as beautiful as Hawaii, just in a completely different way. Do you recall the first time you were introduced to quilling and what was it about it that drew you in? 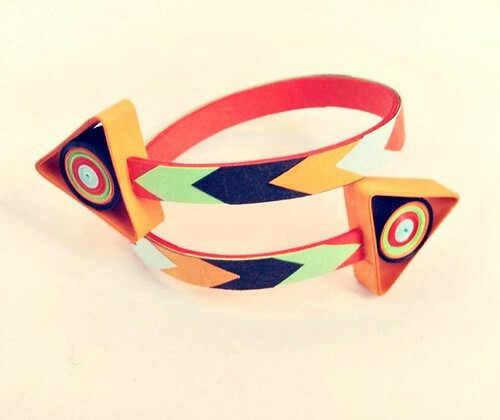 I stumbled across a beautiful pair of paper earrings on Etsy in 2008. The listing didn't mention the word quilling, but I began cutting paper strips and rolling them with my fingers in an attempt to recreate the effect. 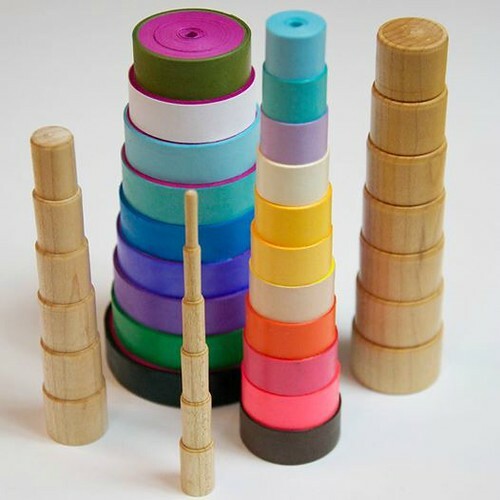 I headed to a local big box craft store to try and figure out what the art form was, and was fortunate enough to find a tool, a little tube of strips and a quilling book. 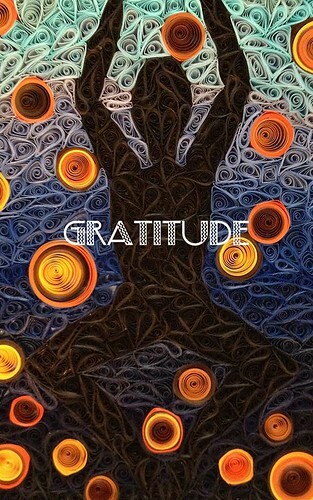 The book did not hold my interest, but the beautiful quilled shapes did; I quickly became obsessed. I was unable to find any other information at the time so I learned through a lot of trial and error. Almost immediately I was inspired to put the pieces together in a mosaic-style picture. I made many of these before moving on to other projects, such as jewelry. I was entranced by the way I could manipulate paper and play with color. 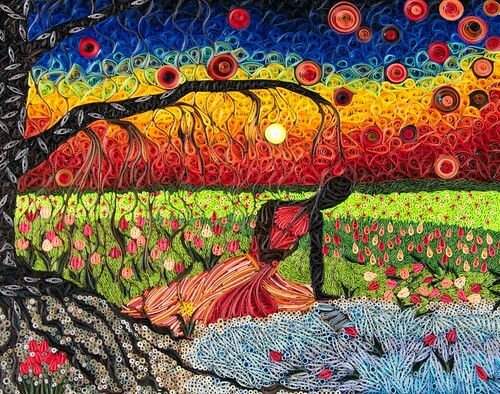 I am passionate for color - quilling has been a fabulous vehicle to express my love of it. 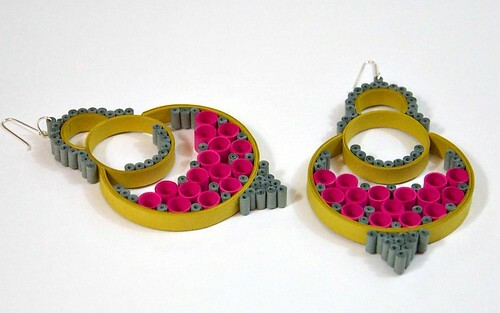 You are very enterprising to be developing your own line of quilling products. Am I correct that you order paper sheets from a mill and cut and package the strips yourself? Yes, I order paper from a variety of paper mills in bulk, and bind and cut it into strips. I then package and label them with labels that I print and cut myself. It has been quite a learning curve since the launch a year ago, but I am slowly getting the hang of things and the response has been overwhelmingly positive. It feels really good to be able to share quilling paper and tools that I love to use in my own work. Do you design the tools you sell? I do design tools and have had a few of the more unique ones that I offer made by craftsmen, but not all. Early on, I decided that I wanted the focus of my line to be high quality paper and tools that are a pleasure to use. For example, the wooden stacked tools are made by a talented woodturner and my bead rollers are made by another. The slotted tool I sell is not my design. It serves as a place holder until I can find someone to manufacture a quilling tool that I really love. There are other suppliers that focus on tools and they do so very well. At this time I am more interested in the paper side of things... I enjoy launching 12 new colors at the start of each season in the highest quality 70lb paper I can find. Currently I offer 48 colors; another dozen will be launched in December and January. Are you finding it difficult to fit in quilling mosaics now that you spend much of your time designing simple projects to share via tutorials and videos, responding to Facebook posts, and filling Etsy orders? Yes, absolutely - my mosaic making has slowed since launching the website and shop. I embrace the busy-ness however. I have always been a person who does things in a furry of obsession. The mosaics consume my life for a hundred plus hours each time I create one. When in the middle of a mosaic, I do very little else and it is all solo work. It is very welcome to have other activities that are related to my passion, but not quite as intense as art-making. I enjoy having contact with other quillers on a daily basis as I find them to be incredibly supportive of one another. It makes this relatively lesser known craft seem so much bigger and more important to me. I love the community and feel immense gratitude for the opportunity to spend my days making things that inspire other people to create things of their own. I should clarify that Erin offers two lines of quilling strips, Culture Pop and Pulp Friction. 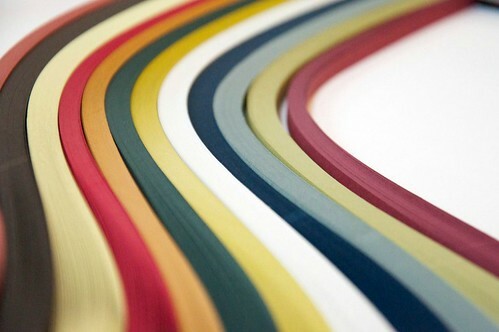 Culture Pop is a premium line of saturated colors, suitable for making paper jewelry and archival projects, whereas Pulp Friction strips are intended for practice and teaching. Erin has a knack for coming up with wonderfully creative color names that add to the fun of quilling. A few examples... there's Chocco Rocco, Velvety Darkness, and Orange Crush! Look for an upcoming Little Circles Culture Pop BOGO sale November 1-4. 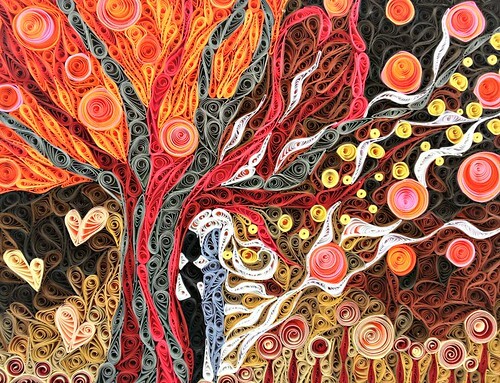 I find it impossible not to fall in love with Erin's one of a kind style of paper quilling! Wishing her best of luck with her venture and I wish that one day I will get the chance to admire her incredible mosaics in person! wow thankyou, her saturation of color and texture is ...well fearless and delightful. Great back story of her adventures. Erin did bring a newness to Quilling with her mosaics. Her energy and enthusiasm is infectious. I simply love her wonderful tutorials which are full of clever Quilling tips. AMAZING...and so lovely to see! 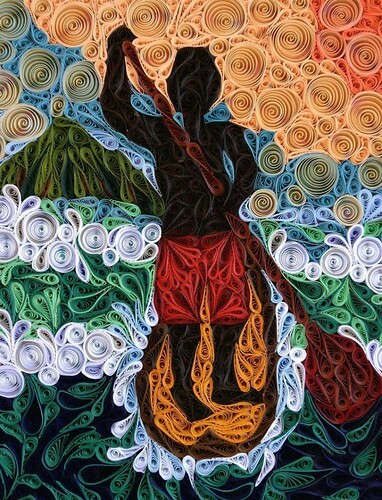 Interesting showcase of quilling! I love the depth that is created. It's a visual that uniquely combines abstract qualities and realistic depictions. Such a unique style of quilling and She has brought new ideas to make Tools too. Love her style a LOT. What a great article Ann. Hi Erin, thank you for sharing you talent with the world. Wish you all the best.I'm in East Lansing.MI Hope I may see you in person some day.....I'm 72 and after some surgeries I discover and signed up to your newsletter. You are an inspiration Erin. Thanks again.